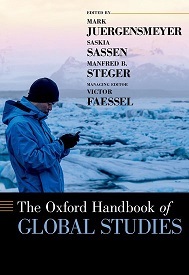 The Oxford Handbook of Global Studies provides an overview of the emerging field of global studies. Since the end of the Cold War, globalization has been reshaping the modern world, and an array of new scholarship has risen to make sense of it in its various transnational manifestations-including economic, social, cultural, ideological, technological, environmental, and in new communications. The editors--Mark Juergensmeyer, Saskia Sassen, and Manfred Steger--are recognized authorities in this emerging field and have gathered an esteemed cast of contributors to discuss various aspects in the field through a broad range of approaches. Several essays focus on the emergence of the field and its historical antecedents. Other essays explore analytic and conceptual approaches to teaching and research in global studies, and the largest section will deal with the subject matter of global studies, challenges from diasporas and pandemics to the global city and the emergence of a transnational capitalist class. The final two sections feature essays that take a critical view of globalization from diverse perspectives and essays on global citizenship-the ideas and institutions that guide an emerging global civil society. This Handbook focuses on global studies more than on the phenomenon of globalization itself, though the various aspects of globalization are central to understanding how the field is currently being shaped. Mark Juergensmeyer is Professor of Sociology and Global Studies at the University of California, Santa Barbara. He is an expert on global culture, with emphasis on the global rise of religious violence and the challenge to the secular state. He has published more than two hundred articles and twenty books, including and the widely-read Terror in the Mind of God: The Global Rise of Religious Violence (University of California Press, 2003), and God in the Tumult of the Global Square, co-authored with Dinah Griego and John Soboslai (University of California Press, 2015). He also has edited The Oxford Handbook of Global Religion (Oxford University Press, 2006). Manfred Steger is Professor of Political Science at the University of Hawai'i-Manoa and Honorary Professor of Global Studies at RMIT University in Melbourne, Australia. He has served as an academic consultant on globalization for the US State Department and is the author or editor of over twenty books on globalization, global history, and the history of political ideas, including: The Rise of the Global Imaginary: Political Ideologies from the French Revolution to the Global War on Terror (Oxford University Press, 2008), and Justice Globalism: Ideology, Crises, Policy (Sage, 2013). Saskia Sassen is the Robert S. Lynd Professor of Sociology and Member of the Committee on Global Thought at Columbia University. Her newest book is Expulsions: Brutality and Complexity in the Global Economy (Harvard University Press, 2014). Victor Faessel, managing editor of the handbook, is Associate Director of the Mellichamp Initiative on 21st Century Global Dynamics at the University of California, Santa Barbara.